Founder and Creator of the skincare line COTARDE- Danuta Dudek shares her thoughts about business and life. The concept of freedom is very important to her personally based on her country’s (POLAND) history. It’s the subject Polish people have the right to be sensitive about – Danuta is the first generation to be truly free in about two centuries.. Since she is a specialist in skincare, Cotarde is simply the expression of her aim for personal freedom. What it really means is that she likes to do things her way and that she prefers to go through life without spending much time thinking of complicated products, routines etc. That’s why everything they do is ready-to-go, travel-friendly, lightweight, multifunctional and working instantly – so you don’t actually have to think about it, just enjoy it in the moment and then focus on your life. What are some of the experiences in your life that helped foster your entrepreneurial spirit? I grew up in a large, Polish family, rooted in patriotic tradition. I was raised in Mazowsze (Masovia region) with the capital city, Warsaw, in its heart. Much of my strength draws from time spent during my childhood with my grandparents, hearing stories about war-time and communism-related topics, shared with us by our family’s older generation. Spending time on their vast grounds in western forest lands of Warsaw surrounded by such a strong, diverse group of strong elders, had a big impact on me and the lives of my entire family. Even now, when I get back to this special time in my mind, it strengthens me. What is your educational background and how did you get into the beauty industry? Very early in my life I felt I would work in the beauty industry. It somehow felt right, and everything I’ve done in my professional life oscillates around the concept of beauty. Most of my education took place in Poland, but I also studied in France and Belgium. My PhD is in Enterprise Management. I earned a Masters Degree in Chemical Engineering, and a Post-graduate Degree in Quality Management. Changing from subject to subject was not easy for me, but I wanted to understand the industry from variety of angles and also merge science with practice. To me, science without practice is dry, and practice without education lacks depth, and so, exchanging knowledge is part of me. When I graduated from my doctoral studies, I presented my findings to scholars in various business schools such as FIT in New York and the University of Stockholm’s School of Economics, in Sweden, to business executives, and it was just great to hear their thoughts, and share mine, about this wide research. Over my journey, challenges were inevitable, but I see them as the true mark of each step in my life. During the eight years I worked on my PhD, I moved from country to country, changed jobs several times, changed specialty and university several times, until it felt right. I do believe by being honest with yourself, and always aiming to do what you love is the only way to be happy in life. I don’t take the concept of freedom for granted, and basically, I took every opportunity that came along to ensure my own freedom in making all sorts of choices. I always wanted to be independent. I started earning my first money in business at the age of 16 and haven’t stopped since. How did you think of this incredible idea of skincare for travel? It started when I met Victor, now my husband and business partner. We met at a Brazilian party in Stockholm. He is from Chile, I’m from Poland and he was getting ready to travel to Bogota, Colombia and I was living in Sweden. With business travel and jetting around frequently to see one another in various parts of the world, I was living my life in airports. After doing so for a while, I realized my skin started to change. It became drier and greyer. It was strange to discover my skin being shiny, breakout-prone in some areas, and very tense in other parts of the face. I naturally started to look for products that would work for me immediately. I am not a heavy user of makeup, and I wanted to look great after being in the office for long hours, an overnight flight, with jet-lag challenges, lack of sleep, etc. I wanted to look fresh right now whether I was going to see Victor or my team back at work. I didn’t want to wait for results for several weeks – and this is how skincare is customarily being formulated. I didn’t think about it back then, but it was through this experience I found a niche that needed to be covered. Ultimately, I created that instant skincare that works right when you need it in changing conditions. It truly began because I needed that for myself, I simply needed such product. Then I started testing it – first on us (we are a family of pilots) and our pilot-friends and frequent travelers. From there it got spread out to become what it is right now – instant, natural and multifunctional concept for busy people with heavy schedule, no time and priorities elsewhere than trying to figure out their way through a large-routine skincare. Cotarde is fun, simple and fast. Because it wraps everything in your body! The largest organ, link between what’s you and what’s around. I’m often shocked how little attention people pay to it or how they treat it, doing horrendous things like rubbing or stretching it unnecessarily, or applying too much makeup that makes them look so artificial and even causes skin issues. Skin is beautiful on its own, we must learn to preserve it over time, not accelerate its downgrading. You know, aged skin can be very beautiful. Also, I think if you dare to wear less makeup than covering it all up way too much, it strengthens your core confidence, it’s truly empowering. Our components are made in the US, Europe and Asia with our research lab in France’s unique, `cosmetic valley.’ We chose this region, because we needed the best know-how and that’s where it is found. It is much like Silicone Valley to the tech startups. It does not mean Cotarde is French per se. Though still a small company, Cotarde is a truly international, global brand, people take us literally everywhere. If I had to choose a “Nationality” of our brand though, it would certainly be American. It’s an American brand at its core, in the way we perceive freedom of thoughts and action. And it was born here, in Miami, to be precise. The packaging is very unique, how did you come up with it? We wanted to do something surprising – and skincare packaging is usually very boring, with lots of text that very few people read. I wanted to pack all our products in small pouches that can be used to store jewelry, keys, coins, etc. and simplify taking beauty products with you when you travel. When passing the security check at the airport, and when it comes to the carton boxes I was inspired by paper planes in terms of their construction and lightweight look. It also fits the brand idea of jet setting. 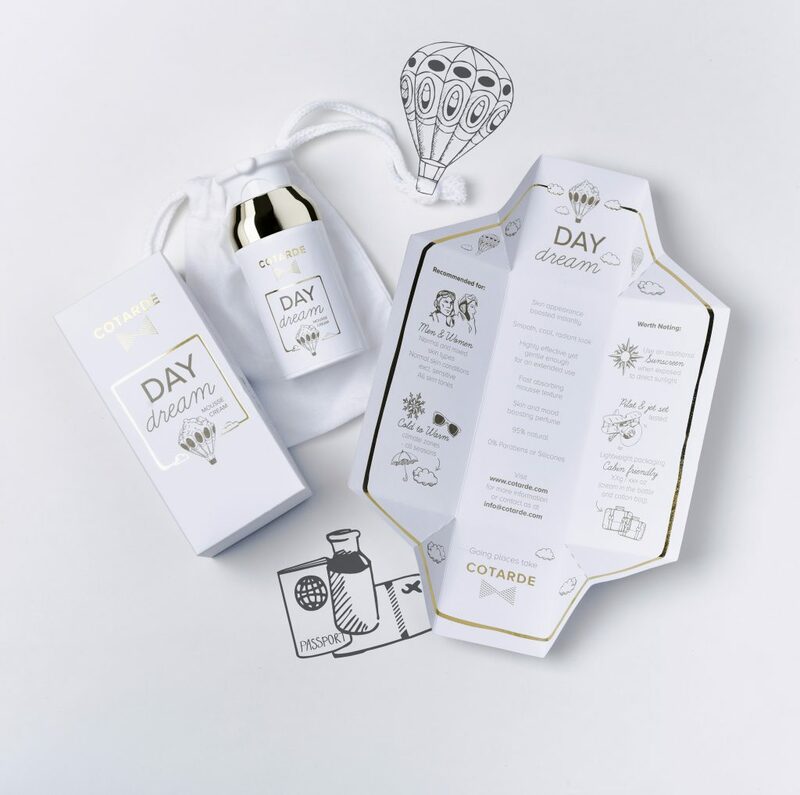 Our carton boxes work as leaflets so there is no additional paper used, they are designed like an origami sculpture, and there is no glue used to fold them. It’s a small masterpiece on its own, and it’s patent pending. All our packaging must be cabin friendly, and basically we are using materials that are lighter than the ones used by competitors (by 60% on average) so you only carry what’s necessary. You know, it adds up and you may end up struggling with uncomfortable weight which is something we all want to avoid. We are scaling up as the reception of the brand has been very positive. We have some very exciting and totally new to the market products upcoming up soon, but then again, patent process needs to reach certain point. We try to launch only the products that are crucial in improving your look and mood instantly – not a ‘’nice to have but not necessary’’ ones. There are plenty of such on the market. Too many actually, it’s quite confusing even for the insiders, not to mention the users. And we believe in a multifunctional use of each product so that you can use our creams as primer or mask. You don’t need a separate item so it’s quite handy and time-saving approach. 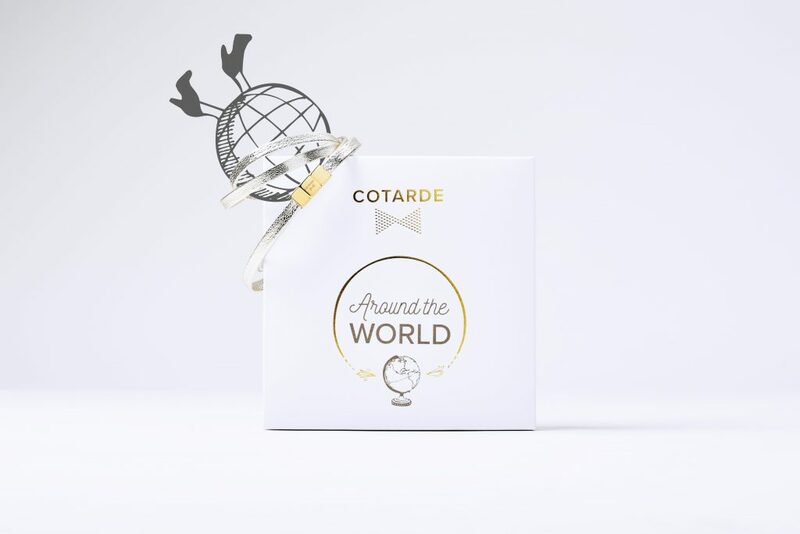 First most important decision was to leave my homeland, and start the exciting journey out of my safety zone that continues – now also with Cotarde – across the world. Second most important was to get married, and that’s a big one too! I love to have one on one discussions actually – I don’t like crowds, I prefer direct contact with few people at a time as it’s easier to get to know others and learn new things both ways. Apart from academic world, I’ve been sharing knowledge on easy skincare through workshops and in-store activities – these days I conduct many of them in our business partner’s fashion stores for active women – Athleta, across the United States. It’s great to listen to people’s experience related to wellbeing and skincare while they aim to balance private and professional duties (and everything in between!). Women are multi-taskers with very busy, often stress-inducing agendas. So we have a lot to talk about. I advise them how to save time on looking great effortlessly every day. There is also one side project I work on, and it’s particularly important for me. It’s a book called ‘’The Creators of Beauty’’ about the most successful beauty brand founders and owners in the world. I had some challenging experience mid-way in Cotarde’s research when I lost all my work because of one of the business vendors, and I looked for an inspiration from beauty people who succeeded. I think I wanted to know that I’m not the only one who experienced this type of difficulty. I didn’t find much, and I realized nobody will tell their stories if I don’t do it myself. This book is not about me. I want to promote those who really made it on a big or small scale in their own way. There is plenty of information about fashion people, everyone knows the names behind big brands, and yet, almost no one knows the great people behind beauty brands. I want to change that, they deserve it. So, yes, you may say I promote much-larger-than-us competitors From my perspective though, this is an important contribution to the development of the whole industry. Where do the great ideas come from that you have implemented in your work and personal life? Everything comes from my life experience. I need to feel it, only then it’s really strong and makes sense. I also believe in my intuition, it’s been a great lead in my life since I remember. Reading. Definitely. Read as much as you can – books, magazines, on the internet. I wish I had more time to do it, I love books in particular, and my personal library is quite big. I keep only the good ones though, the ones I know I will re-read some day. Reading will calm your mind, make you think, smile and experience all feelings possible. I think it would have to be the past and the future. I think of the past, everything I’ve experienced, time I spent doing this and that, and I respect my own efforts, sleepless nights trying to combine work and studies (I’d usually go for two courses at a time so it used to be crazy!). This keeps me moving, along with the excitement for the future. I’m particularly interested in human’s adventurous plans for traveling outside of planet Earth. Apart from research on pilots, we started doing research on astronauts, their lifestyle and the way their bodies behaves when out there. To me this is the most exciting, the ultimate journey for human beings. I can’t wait when it becomes a regular, normal way of living. And it will, sooner than most of us can imagine. We will be ready with Cotarde to accompany you on that journey! Believe that you’ll make it. No matter what and how hard it may be or how much time something takes. Self-respect. It helps to make the right choices in life, no matter your other character traits or circumstances. Listen to yourself. That means – talk with yourself, and listen. I do have some fears, and I had even more in the past. The only one way I know to deal with them is to confront them in the right time. You’re not always ready to do it but when the time comes, don’t wait. It’s a liberating feeling, though I’m aware sometimes we spend entire life with particular fears. So it depends on what is it. It would have to be painting. I love to paint in oil, particularly women’s portraits (I made an exception for my husband and few friends though!). I find their faces very intriguing as they express so much, often without their knowledge. Although painting in oil is time-consuming and challenging form of art, it is a wonderful medium if you know how to use it. In today’s world where we see so much instant, fast contents that pretends to be artsy, I value it even more. Usually with my family – both Victor and I are very active people obviously! So the rare moments when it’s the three of us (with our little daughter Julia) enjoying some family time together is the best. The funny thing is that it’s usually Julia who initiates it – she grabs our hands and wants to dance together or makes us sit down by the chimney and presents some sort of performance. It’s the best time ever! Give us some insight on you – favorite foods, vacation or places to go, fitness- how do you spend a day alone? I don’t like experimenting with food, it takes too much time, and it’s just not my thing. I eat very simple meals made of few ingredients. I drink plenty of water. I’ve been to many places in the world but there are two that I always like to get back to. First one is southern Chile, which I discovered thanks to my husband. It’s a truly far-away place with quite raw nature and not too many people around. The second one is much more popular – south of France – and enjoy the stunning views from the roads between France and Monaco. It doesn’t happen often, but if I have a day alone, it means I travel somewhere again and I spend my day on a plane yosome new or not-so-new to me place. Movement is such a big part of my life, that it seems to be the best way to spend my day.